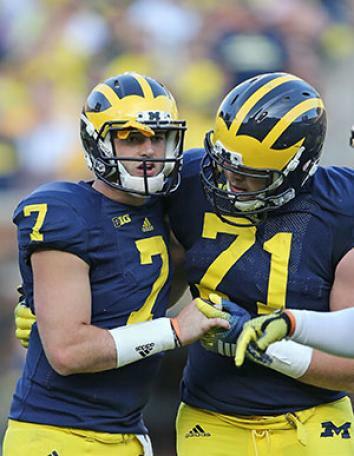 Brady Hoke, Michigan Man: It’s time for Michigan to fire its toughness-obsessed coach. It’s time for Michigan to fire its toughness-obsessed coach, Brady Hoke. Michigan coach Brady Hoke shouts instructions during the game against Minnesota on Sept. 27, 2014, in Ann Arbor, Michigan. When the University of Michigan hired Brady Hoke in 2011, the Wolverines’ new coach could not stop talking about toughness. “We’re gonna have a foundation of toughness, knocking guys off the ball, because that’s how football is played,” he said in an early interview. “Toughness, running the football, stopping the run,” he explained in a press conference, are the characteristics of the teams he’s coached. On Saturday, Hoke used that same tough talk to explain away an unconscionable decision. In the fourth quarter of Michigan’s game against Minnesota, quarterback Shane Morris was hobbling around on an injured leg. Unable to evade pressure, Morris was clobbered below the chin by a Minnesota defender. After peeling himself off the ground, a clearly woozy Morris stumbled into the arms of one of his offensive lineman. And yet the Michigan coaches left him in for one play. Even worse, they brought Morris back into the game moments later when his replacement, Devin Gardner, lost his helmet. ESPN’s announcers, and most everyone else watching on TV, were appalled. After the game, Hoke said he didn’t know if Morris had a concussion and explained that it was the player’s responsibility to diagnose himself. “Shane’s a pretty competitive, tough kid, and Shane wanted to be the quarterback, and so believe me, if he didn’t want to be, he would’ve come to the sideline or stayed down,” the Michigan coach said. The next day, Michigan released a statement under Hoke’s name that said Morris hurt his leg and made no mention of a possible head injury. On Monday, a defiant Hoke said he would never put a player at risk, especially in the case of head trauma, reiterating that Morris had a high ankle sprain and nothing more. Again, he invoked the rhetoric of toughness. “Guys play beat up every day. If they’re not beat up a little bit … then they’re not doing much,” Hoke said, adding that players “love to compete, and that’s just part of their DNA.” What’s a coach to do? A half day later, in the middle of the night—at 12:52 a.m. on Tuesday—Michigan athletic director Dave Brandon issued a statement acknowledging that Morris “was diagnosed with a probable, mild concussion.” It’s clear, then, that Hoke either lied on Monday or had no idea what was going on inside the football team that he’s supposed to be in charge of. Even if you believe that Hoke didn’t see his quarterback take a hit to the head in real time, how could he have not seen Morris wobble around on instant replay? How is it possible that, after viewing the game film, he wasn’t curious enough to follow up with the medical staff or anybody else? And how can anyone possibly defend a man who, faced with a national controversy centering on egregious medical care, would invoke ancient football clichés about toughness, playing hurt, and loving to compete? I was a senior at Michigan when the football team won that national title in 1998. I desperately wanted Brady Hoke to succeed because I want to watch Michigan win. But it’s clear now that he should no longer be the coach at Michigan, and the school needs to rethink what it means to be a Michigan Man. This Michigan Man mythos began in 1989. Before that year’s NCAA basketball tournament, Schembechler, then the athletic director, said that coach Bill Frieder—who had just accepted a job at Arizona State but planned to coach through March Madness—would be relieved of his duties, because a “Michigan man is going to coach Michigan.” Steve Fisher took over and led the Wolverines to a national title. The Michigan Man was born. Since then, Schembechler’s words have come to mean something much more. Frieder, after all, grew up in the state and had undergraduate and graduate degrees from Michigan. Schembechler and Fisher had none of those credentials. Nonetheless, the moniker came to stand for a coach who showed his reverence for the university by embodying the same thing Schembechler did: toughness. Big Ten toughness. The kind of toughness that you need to play “hard-nosed, big-boy football,” in the words of athletic director Dave Brandon, who played for Schembechler. 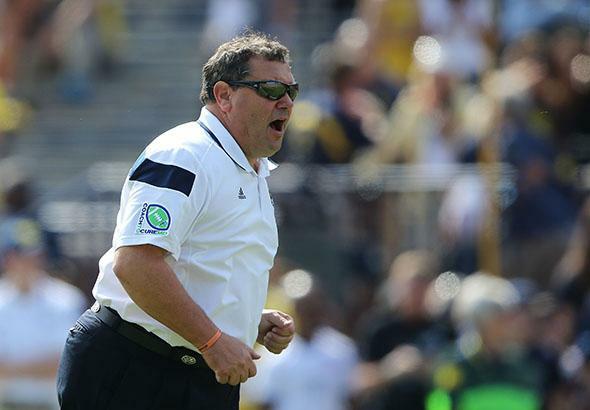 Hoke embodies the Michigan Man caricature to an almost cartoonish degree. He claims that he has never donned the color red as a head coach—the color of Michigan’s archrival Ohio State—despite being employed by red-wearing schools Ball State and San Diego State. There’s evidence to suggest he pulled it off. At his opening press conference, he famously—and angrily—responded to a question about whether it was still an “elite job” by saying, “This is Michigan for God’s sakes.” He said he would have walked to Ann Arbor from San Diego. He got it. He understood that Michigan is different. In 2011, Hoke led Michigan to an 11–2 record, after the team had won only 15 total games in Rodriguez’s three years. The team’s academic performance and retention rates also improved under Hoke. To many, this was evidence that he was exactly what Michigan needed. Well, until the team started losing. During Rodriguez’s tenure at Michigan, he received almost no support from alumni—especially former football players. There is a whole book about it. Former wide receiver Braylon Edwards once introduced himself on Sunday Night Football as being from “Lloyd Carr’s University of Michigan”—the Michigan of the Michigan Man myth, not Rich Rodriguez’s fancy-pants Michigan. After Rodriguez failed, spectacularly, to lead Michigan to the promised land, fans felt justified in looking for something totally different. And by totally different, I mean exactly what they had before Rodriguez. Now they have it: a guy who says he wants the identity of the program to be “a toughness I think this program has had for many years.” The problem is, when you’re trying so hard to prove that you’re tougher than everyone else, you risk losing sight of the limits. When you are trying to return to a bygone era, you run the risk of forgetting everything we’ve learned about player safety in the last few years. It’s not inevitable that a tough Michigan Man would leave it up to a 20-year-old to bench himself if he has a concussion. But it also shouldn’t be that surprising. Guys play beat up every day, after all. Hoke called Shane Morris a “pretty competitive, tough kid.” What he seemed to forget is that Morris is just that—a kid. Someone else has to be the adult, and Hoke failed on Saturday, and he keeps failing every time he opens his mouth. The student section booed Hoke when he failed to pull Morris out of the game, and the school newspaper has now called for him to be fired. If the team was 5–0 rather than 2–3, Michigan fans might be willing to give the coach another chance. It doesn’t matter, though, that the calls to fire Hoke have likely been influenced by his poor record (17–14) over the last 2½ seasons. This Michigan Man needs to be evaluated based on his words and deeds. In the days following the Shane Morris debacle, Hoke couldn’t stop talking about toughness and competitiveness when he should’ve been saying words like accountability and responsibility. This macho shtick might have been what Michigan alums thought they wanted, but as Brian Cook of MGoBlog wrote this week, this is not Michigan anymore. At least, I hope it isn’t. Correction, Sept. 30, 2014: Due to a photo provider error, the second image’s caption originally stated that Shane Morris was helped off the field by Ben Braden. Morris did not leave the field; Braden was steadying him.